On the grounds of Startblok Riekerhaven you’ll find nine blocks of houses. Outside there is plenty of space for parking bikes and cars. There are two large green outside areas for recreational use. The studios are spread over 7 blocks with two to three floors per block (see A). The blocks are divided into living groups of 16 to 32 studios. In each living group status-holders and Dutch youngsters, both men and women will all live mixed together. Each group will have two Group Managers [link naar Self-managers]. Also, in every group there will be a common living room for social activities! The rooms are spread over 42 three-room apartments (2 private rooms and 1 common space) and 6 four-room apartments (3 private rooms and 1 common space). 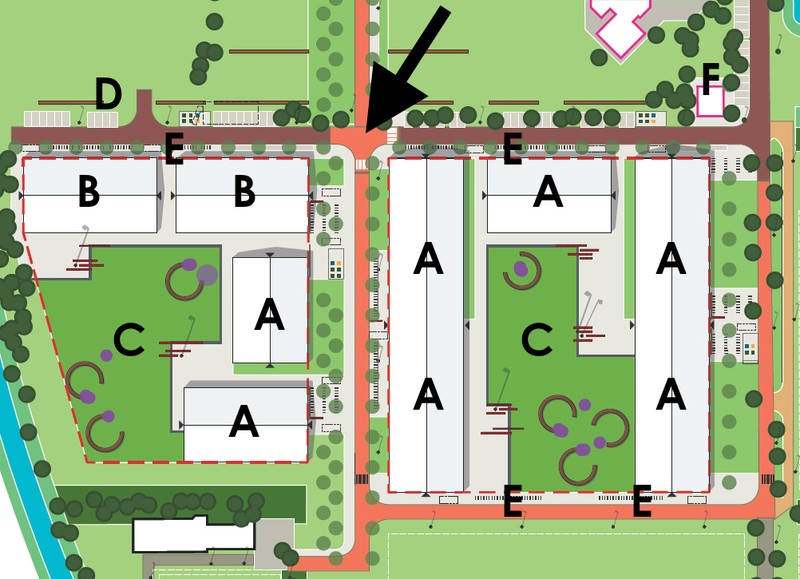 All apartments are spread over 2 blocks with three floors each (see B). Outside, two seating areas will be created. Here you can relax in the sun or barbeque with your roommates and Buddies in the evening. Furthermore, there is plenty of space for various activities, such as gardening, sports and all the any other initiatives residents come up with. Around Startblok you’ll find several places where you can park your bike in racks (E), with enough space for all tenants. At the side of the grounds, there are several parking spaces for cars (D). This is paid parking though, and a parking permit needs to be requested at the Municipality of Amsterdam. Besides common living rooms in the living groups and the outdoor areas, there will also be a large space for indoor activities. At the moment we are developing plans for this building. Most likely, we will build a space next to the office of the Self-management Team (see F). At this office you can visit the self-managers during opening hours. Also, there will be space for other tenants who want to organize something, need a place to do some work or study. The dog association, who train their dogs on at the adjacent grounds, will also use the office.